April is Alcohol Awareness Month. It is a nationwide campaign to raise public awareness about the use of alcohol and its effects on individuals, families and communities. It provides opportunities for Al-Anon and Alateen groups to reach out to families and friends of alcoholics who are suffering and still unaware of the Al-Anon program of recovery. It is estimated that over 18 million Americans have a drinking problem. According to commonly accepted healthcare provider estimates, each problem drinker can significantly affect the lives of at least four other people. Using population estimates, statistics indicate that over 300,000 people are affected by someone else’s drinking right here in King County. We hope Al-Anon and Alateen members, Groups, and Districts will think of how to spread the word of Al-Anon and Alateen to those still suffering in the community. Is there a school, community center, or library where a poster or meeting schedules could be displayed? Could you send a letter to a doctor, clergy member, or counselor explaining what Al-Anon/Alateen is and what it has meant to you? Could an Al-Anon press release be posted in a community newsletter or online blog? 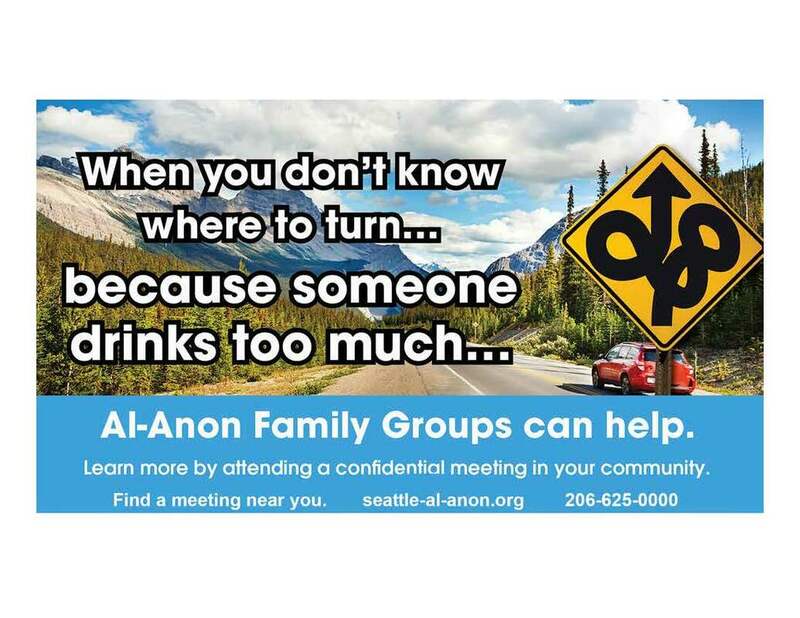 I am only one Al‑Anon member, but I can draw attention to the fact that alcoholism is a family disease and to the availability of local Al‑Anon and Alateen meetings. 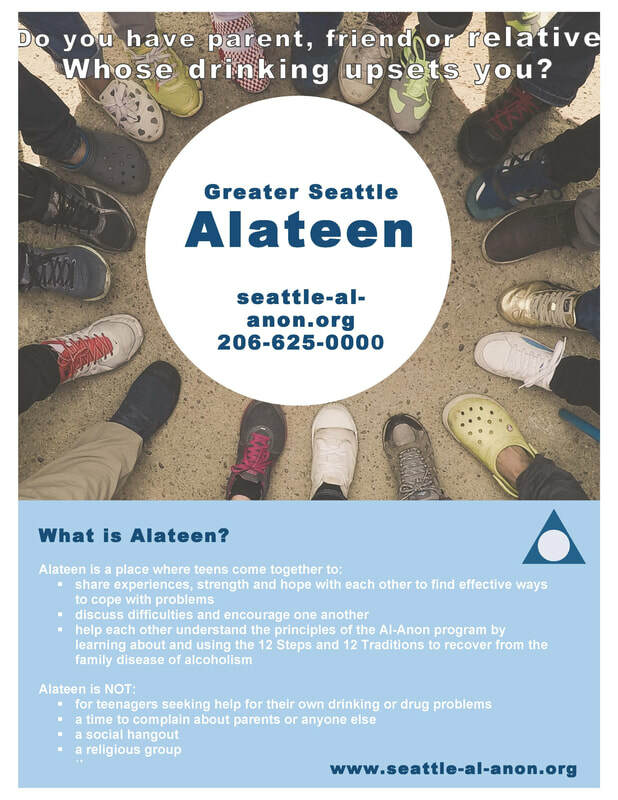 Below are posters to print and post as part of your personal outreach to the friends and families of alcoholics who have not yet found Al-Anon and Alateen. • Has Your Life Been Affected By Someone Else’s Drinking? There also are also a number of Open Letters to Professionals that can be downloaded for free from the al-anon.org website. Press releases can be found on the WSO website at https://al-anon.org/media-kit/news-releases/. All Al-Anon/Alateen members are invited to join other members from around Washington state at the Summer Seminar Assembly (SSA) as we observe our Third Legacy of Al-Anon: Service. The Assembly is the weekend of May 17-19 at the Seabeck Conference Center. The WA Area Delegate will report on what is new at the World Service Office. You might ask, what else may I learn by attending this Assembly? Tentative workshops include: How do I herd cats? Spiritual money. What is it like to attend an Al-Anon meeting, when I’m the only English speaking person in the room? Alateen Awareness. What process do we use to formulate a motion? Group Safety. How do I write and submit submissions to the Forum? How do I know what information to include on a flyer I intend to post online? And much more! Note: Each workshop is subject to change. In addition to the seminars, there are also regular Al-Anon meetings for a full weekend of fellowship. Besides its large number of interesting workshops, SSA is slightly different from our other Assemblies in that your registration is all-inclusive. It includes lodging and family-style meals on Saturday and on Sunday morning. The early registration deadline is April 17th, and you may register online (http://wa-al-anon.org/ssa-online-registration/) or on paper. Please be sure to specify the building you would like to lodge in on the line for specifying your roommate. My sponsor taught me early on: If we build it they will come! Looking forward to seeing you all there! - WA Area Alternate Delegate Lynn T.
The AIS website at www.seattle-al-anon.org has most of the information that members in the Greater Seattle area might want about current meeting information, special events, contact information for trusted servants at the AIS and District levels, and the latest Al-Anon news, and temporary meeting cancellations. Below are three examples of how you might use it. Want a Flyer for an Event? Just go to the Events page and click on the image of the flyer you want to print. It will open as a .pdf. Simply print it in color or black and white to share with Group members. In the header of the Events page and on the Members page, there is a link to the full listing of all 2019 scheduled events. By checking that calendar, you can avoid scheduling conflicts. Download an Excel file of all the literature available at the Seattle AIS Literature Distribution Center. It includes pricing and shipping charge information. There are separate forms for English, Spanish, and Alateen Conference Approved Literature. - Bits Editor Teresa H.
There are a few slogans that help me when times get tough. “Easy Does It!” stands out as does “How Important Is It?” The sunny side of slogans is that they are easy to remember and can give me a quick lift when chaos brings me down. Other sayings are equally easy to remember and just as powerful. Sayings that parents, siblings, and teachers said so often I came to believe them - believed so completely that I learned to say them to myself. I learned them so thoroughly that they came to have the same power as those positive Al-Anon slogans. I heard them or some variation all through school because I can’t spell. Even if I remember how to spell a word because I use them regularly, as soon as I stop writing them for short periods I forget again, it is so bad that I often change what I am writing because I can’t even get close enough for spell check to suggest the correct spelling. I remember being in grade school, somewhere between the 2nd and 6th grades, I wa having trouble with spelling, and my father was determined to help me. We took the 10-word spelling list – remember those? And my father had me try and spell them without any practice. I got maybe half right. We drilled for a while, and by the end, I could spell all 10. Dad said, “See, you just have to try.” The next night we were going to do a refresher, and on the first attempt, I got the same 5 right from the first night and the same 5 wrong. Again we drilled and again I spelled all 10 correctly. The third night I got maybe 6 right on my first attempt; drill, drill, drill, and all 10. The last night before the quiz and sure enough I got 7 right. We drilled like crazy, and again I could spell all 10. The day of the quiz I got maybe a D grade for getting 7 words right. My father never worked on spelling with me again. I just turned 74 years old, and I still have words that I can’t remember how to spell. Which brings me to the slogan that most represents my life in Al-Anon. Progress, not Perfection. If I had to spell or write perfectly, I couldn’t share this article since I’m not a perfect writer. The joy is I don’t have to be “perfect,” I just have to be good enough to share my experience, strength, and hope. Every time those old sayings of “you are stupid” or “you are lazy” scream at me, I remind myself that while I’m not perfect, I am quite good enough! - Bits Columnist Allen L.
In the household I grew up in there was often conflict, confusion, and chaos. The rules were arbitrary, and stability was elusive. It seemed that even as a child, I was to blame for many things. This was a painful way to experience life, and I was groomed to be overly responsible at an early age. Grownups were not really consistent with the way they behaved, and adding alcohol and other mind-altering substances just increased the gathering whirlwind of chaos: conflicting thoughts and conflicting feelings. Confusion and bewilderment overshadowed the ability to think clearly. This was the power of denial and cognitive dissonance. Before recovery, I carried with me the unrelenting drive of over-responsibility. I thought that love meant that I needed to “rescue” family members and other people I cared for from their own choices and addictive behaviors. They were hurting themselves in so many ways, and the old conflict, confusion, and chaos would resurface and became my uninvited companions. So much of my mind was preoccupied with how I needed to help others, and I spent much of my energy doing research and trying to figure out how to make my dysfunctional relationships work. I got into recovery and started to learn about codependency and how rescuing people from the natural consequences of their actions was actually hurting them (and me). I hated to see people in pain, so I would throw down emotional pillows to keep them from hitting bottom and really feeling it. Later, I started hearing about a more redemptive set of three C’s. “I didn’t cause it.” It wasn’t my fault that someone was drinking or “using” their addiction of choice. I didn’t make them dependent upon it. “I can’t control it.” No matter how much I cared about them, I could not make them modify their behavior. I could turn myself inside out and be hyper-vigilant, and that would just make my life increasingly unmanageable. “I can’t cure it.” I sure wish I could, but that ball is not in my court. I have lost a lot of people to alcoholism and the effects of alcoholism. Through various levels of detachment with love, I can let them know I care about them without dragging myself onto their side of the street. I know I have had to hit my own excruciating bottom to begin to deal with my own dysfunctional patterns. Sometimes a window opens, and the person suffering from addiction asks about recovery. I can be a bridge to resources. I can let that person know that I am “for” them and encourage steps toward health. But then I must let them embark on their own unique journey. - Bits Columnist Callie D.
Many Al-Anon members start their day by reading from one or more of our daily readers: One Day at a Time in Al-Anon (ODAT), Courage to Change, and Hope for Today. They are great program tools. But what is the difference between them? What is their history? Which one is the best one for me? All three books have a similar format. Each day of the year has a short share followed by a daily reminder or thought for the day and ending with a quote from either an Al-Anon member or an inspirational quote from a named source. All three elements are contained on a single page for each day of the year. The first Al-Anon daily reader was One Day at a Time in Al-Anon, published in 1968. In keeping with the concept of a daily reader, it focuses on living One Day at a Time. The tone is set in the January 1 reminder that states: “I can live my life only One Day at a Time.” In my mind, it also has a greater emphasis on “God” and refers to “Him” more than the later readers. On January 1 the quote of the day includes, “Let me remind myself to bring every problem to Him for I know He will show me the way I must go.” Many of its daily quotes are taken from the Bible. Affectionately referred to as ODAT by many Al-Anon members, it is a source of guidance for members who read through it year after year, one day at a time. No matter when or how you arrived at the doors of Al-Anon, any of these three books provide a daily dose of hope and healing from the family disease of alcoholism. - Bits Editor Teresa H.
Let’s Talk about Safety in Al-Anon Meetings! Safety has been a topic at Al-Anon conferences at all levels of the organization for a few years. Now there is a new 4-page WSO document to generate discussion at the Group level, Let’s Talk about Safety in Al-Anon Meetings! All Groups are encouraged to read and print it at https://al-anon.org/pdf/Safety-in-Al-Anon-meetings.pdf. Topics covered include Dealing with Disruptions, Group Safety and Unity, Al-Anon and the Law, and Emergencies. As stated in the document, “Safety is important to the functioning of the group. When members maintain order and safety in meetings, the group as a whole benefits, and all those involved are able to focus on recovering from the family disease of alcoholism and learning how to live a serene life.” - Bits Editor Teresa H.
In March a group of 11 Al-Anon and Alateen members came together to meet and discuss how we can support and grow the Alateen programs in the AIS area. Each member came for their own reasons and hopes. • Some had experienced the challenges of living with alcoholic parents while growing up. • Some had worked with troubled teens and found that it helped in their own program. • Some had experience in Alateen and wanted to help. • Some were just interested and loved the principle of service in Al-Anon and wanted to give back. • Some knew that the Alateen meetings were shrinking and wanted to ensure there were resources for them. • Some were excited about Alateen and loved the idea of spreading the word and having Districts working together. • Some talked about how helpful Alateen would have been if they had found this resource early in their recovery. Each one came for their own reason but they all had one purpose and that was to ensure that Alateen and the recovery that it offers would be available to any teenager in our AIS area. Alateen is a place where teens come together to share their experience, strength, and hope with each other and find effective ways to cope with problems. We now have only 4 Alateen groups available to support the recovery of teens. • Develop a coordinated program for outreach to schools. • Communication is key! Improve the Alateen presence on the AIS website and in the BITS and on social media like YouTube. • Include Alateen speakers and programs in Group meetings. • Contact local crisis lines so they know how to refer callers to Alateen and contact local shelters. Members came together for their own reasons but one thing was very clear in this meeting, and, was a belief held by all attendees: Recovery is for everyone. This group agreed to meet again on Wednesday, May 1st at 7:00 PM. Please join us as we move the discussion into action. - AIS Alateen Liaison Kathy B. Tradition Four: Each group should be autonomous, except in matters affecting another group or Al-Anon or AA as a whole. How did this recovering come about? Many of us got a sponsor, worked the Steps, or embraced the slogan “Live and Let Live.” Also, we witnessed the wisdom practiced in Tradition Four. Tradition Four states, “Each group should be autonomous, except in matters affecting another group or Al-Anon or AA as a whole.” Each group is free to set the structure and parameters of its meetings. We have autonomy. We meet our Group’s needs calmly and openly. Before Al-Anon, many of us had our needs ignored or rejected. We learned to manipulate and control instead. Tradition Four can relieve us of that character defect. It gives us guidance on how to meet the needs of our group, and by extension, our lives, without control or manipulation. 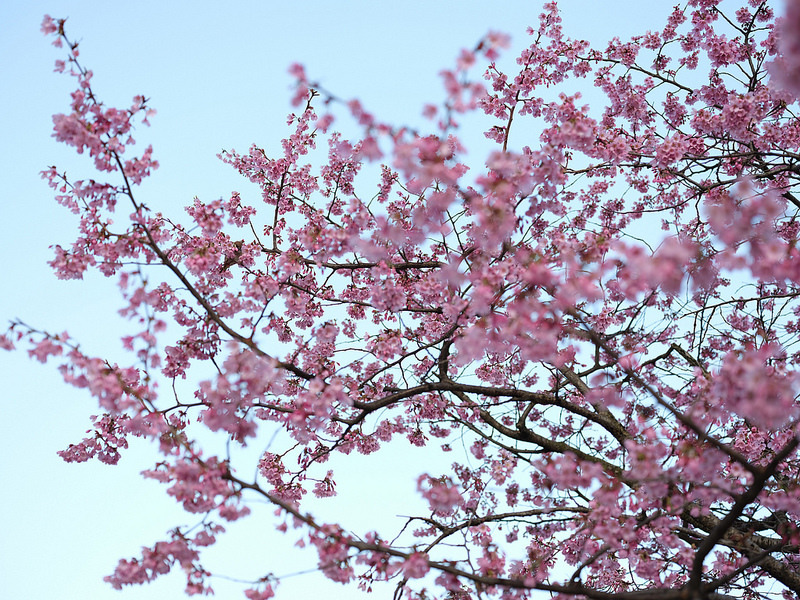 Tradition Four also encourages us to practice what’s best for Al-Anon and AA as a whole. Again, this is so different from the situations that brought us to Al-Anon. Those situations often focused solely on the needs of the alcoholic, limiting the scope of our attention and neglecting broader concerns. In Al-Anon, we realize we can meet our own needs while also addressing the needs of others. It’s refreshing to see members practice this balance not by control or manipulation, but by thoughtful consideration of all. What a relief to know we can meet our needs in healthier ways, while also respecting the needs of others. Tradition Four is just one of the many tools we have that shows us how. - Fawn B. The Friday Night LGBT AFG that meets at 8:00 PM has relocated to Peer Seattle at 1520 Bellevue Avenue, Ste. 100, Seattle. The meeting is specifically for LGBT members and is a closed meeting lasting one hour. It is handicap accessible. ​Districts 15 & 16 hold a joint business on the third Saturday of the month. Because of Easter, the April meeting will be on April 13, the second Saturday of the month. In May, there will be no meeting because of the conflict with SSA. In June, the meeting will permanently move from its current location at Grace Lutheran to St. Luke’s at 3030 Bellevue Way N.E., Bellevue. The meetings will continue to be on the third Saturday of the month from 8:30 -10:00 AM. The first meeting at the new location will be on June 15th. ​Districts 18 and 19 will NOT be meeting in April. • Vice Chair Doug L. chaired the meeting. He reported that he and Chair Eliza D. had met to discuss options for outreach to Districts within the AIS service area. A discussion followed that included explaining the three-legged stool of donations, literature purchases, and service. Encouraging service was emphasized with additional discussion regarding AIS office volunteer training. He also presented a member’s question about literature costs including sales tax and fees. The Council concluded that the convenience of buying from AIS outweighs any additional costs. Doug L. presented a question from a Group asking if AIS liability insurance covers regular Group meetings. It does not. It was suggested from members’ experience that the Group request a waiver from the church which has worked for other Groups or relocate to a place that doesn’t require the waiver. • Treasurer Linda H. reported that we did not file an appeal in response to the denial of our WA State property tax exemption after consulting with an accountant. She also reported that she is still working with our former landlord at the Vance Building to agree on a final amount for our closing bill. She also asked for input on the amount of Board insurance coverage we should use for our application. Teresa H. volunteered to make inquiries and will report back. Linda H. reviewed the monthly Treasurer’s reports for January and February noting that expenses are down in all areas except for the professional consulting area due to the consulting fees regarding the property tax issue. Despite the additional expense, we are in the black for the year. • Communications Coordinator Teresa H. reported that changing the format of the BITS email to subscribers seems to have solved the problem with some subscribers not receiving the email because their provider was rejecting it. She also reported that adding meeting cancellations to the website homepage during the February snow storm was a big hit. Groups should send cancellations of any kind to communications@seattle-al-anon.org. • LDC Co-Coordinator Elizabeth G. reported that 2 office volunteers are still needed to work on one Thursday per month. She also reported that the new Just for Tonight bookmark is selling well and that the Spanish “Intimacy” book is now in stock. • A report by Phone Volunteers Coordinator Karen T was read, which mentioned that more phone volunteers are needed. • New Alateen Liaison Kathy B. reported that we are down to only 4 Alateen Groups in our AIS area. The problem seems to be either not enough AMIAS or not enough Alateens. She has met with the WA Area Alateen coordinator. Some ideas: Regular Alateen branding, add AMIAS trainings, and more about Alateen in the BITS. The goal is to have 5 meetings by September, either in the schools or alongside Al-Anon meetings. There is lots of energy around building Alateen! • Outreach Co-Coordinator Ellen M. explained that April is Alcohol Awareness Month. The Outreach team is exploring the best way to reach medical professionals with the Al-Anon message. - Bits Editor Teresa H.
Going to WA Area PreCon?